As the world population continues to exponentially increase, so does the demand for new products. Because of this constant rise in demand, sustainability is a major concern to everyone in the manufacturing, refinement, agricultural, and mining industries. However, urgent need typically sparks remarkable innovation, and one of the most compelling new solutions to this growing problem is in the realm of bioengineering, specifically biofabrication. 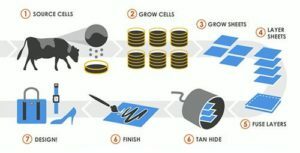 The process is extremely complex, but basically biofabrication is the use of DNA manipulation to artificially grow collagens and other cells. Strangely enough, it also uses 3d printing technology in order to combine cells and materials accurately to culture tissues. Although it sounds like something out of a science fiction novel, this process is now being used to produce one of the most popular fabrics in the world: Leather. Modern Meadow recently raised 40 million dollars in hopes to become the world’s premier leather providers, and they’ll never have to touch a single cow. CEO and co-founder Andras Forgacs hopes to use this money to expand his current operation and scale upwards, with the ultimate goal of being a global supplier of the engineered fabric to fashion companies, textiles manufacturers, car manufacturers, and more. Leather sales across the world are expected to rake in an estimated 91.2 billion dollars by the year 2016, and with all that money on the table, Modern Meadow has been able to attract some sizeable investors, including venture capitalist Bart Swanson of Horizons Ventures. The only major challenge Modern Meadow now faces is streamlining the engineering process in order to reduce cost, and as of right now they’re unable to produce a hide for a competitive price point compared to a natural cow-hide, but their leather is special in that the customization options are limitless. 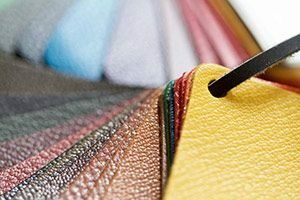 They are able to make leathers that specifically fit the needs of every customer, and buyers can customize their leather’s flexibility, elasticity, and thickness. In addition, Forgacs explains “We’re making a material that has no hair flesh or fat on it. So the liming and toxicity you see elsewhere in the leather trade is eliminated.” The leather is also precisely cut and measured beforehand, so much of the waste that plagues today’s manufacturers of leather goods is eliminated. With the combination of sustainability, customization, and ethical nature of biofabrication, Modern Meadow is poised to make a big splash in the coming years. What will be interesting is to see how this translates to other animal hides that are far more expensive, such as chinchilla, alligator skin, alpaca, etc. Furthermore, as technology improves we could see a material that is a combination of different animals, taking a selection of desired properties from a number of species and combining them into a new hide altogether. Wooly Mammoth moccasins? Sabertooth tiger vests? It’s not entirely out of the realm of possibility. After all, 20 years ago biofabrication would have been considered impossible.